SHOTSMAG CONFIDENTIAL: Smash Hit Thrillers, Noir Nightmares, Secret Agents 2013 Theakstons Old Peculier Crime Novel of The Year Longlist Revealed. Smash Hit Thrillers, Noir Nightmares, Secret Agents 2013 Theakstons Old Peculier Crime Novel of The Year Longlist Revealed. A debut novelist muscles up against giants of the genre as the longlist is announced for the 2013 Theakstons Old Peculier Crime Novel of the Year Award, one of the most prestigiouscrime writing prizes in the country. Lee Child who won the Award in 2011 returns to the longlist with The Affair, dubbed‘his best book yet’. Sizing up to the phenomenal Jack Reacher is the master of the race-against-time thrillers, Simon Kernick, with Siege. Other giants of the genre on the long-list are Stuart MacBride with Birthdays for the Dead, and two-time award-winner Mark Billingham for his stand-alone novel, Rush of Blood, said to be his most ambitious and accomplished work to date. Irish authors Gene Kerrigan’s The Rage and Stuart Neville with his nightmare noir Stolen Souls also feature alongside last year’s winner Scottish author Denise Mina who seeks to defend her title with her Glasgow thriller Gods and Beasts. The list is dominated by powerhouse authors, but there are a few dark horses. Lisa Ballantyne is the only debut author on the longlist with her first novel The Guilty One which caused an international stir and was a runaway success at the Frankfurt Book Fair. SJ Parris’s historical thriller, Sacrilege, featuring Giordano Bruno, the radical philosopher and secret agent reveals the breadth of the genre alongside Stav Sherez’s A Dark Redemption, an unflinching, intelligent detective novel exploring the underworld of illegal Ugandan immigrants. 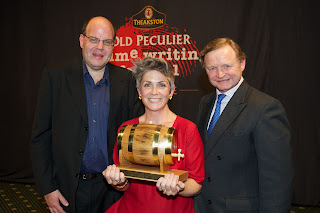 Now in its ninth year, the Theakstons Old Peculier Crime Novel of the Year Award, in partnership with WHSmith, was created to celebrate the very best in crime writing and is open to British and Irish authors whose novels were published in paperback from 1 May 2012 to 30 April 2013. Longlisted titles will feature in a four-week campaign until 6 June across 600 WHSmith stores and 80 library services, representing a total of 1645 library branches. The longlist will be whittled down to a shortlist of six titles which will be announced on 4 July. Previous winners of the Theakstons Old Peculier Crime Novel of the Year award include Denise Mina, Lee Child, RJ Ellory, Val McDermid, Allan Guthrie, Stef Penney and Mark Billingham (twice). The winner of the prize will be announced by title sponsor Simon Theakston at an award ceremony hosted by radio broadcaster and Festival regular Mark Lawson on 18 July on the opening night of the 11th annual Theakstons Old Peculier Crime Writing Festival in Harrogate. The winner will receive a £3,000 cash prize, as well as a handmade, engraved beer barrel provided by Theakstons Old Peculier.